As summer comes to an end, it’s time to get ready for the change in the seasons and the less than favorable conditions that come with it. As the leaves drop for fall, and the presence of snow, rain and ice become prevalent, it’s important to keep safety in mind when dealing with these revived factors. Do you currently have a severe weather protocol? What do you do when lightning is in the area, or if winds are especially heavy? 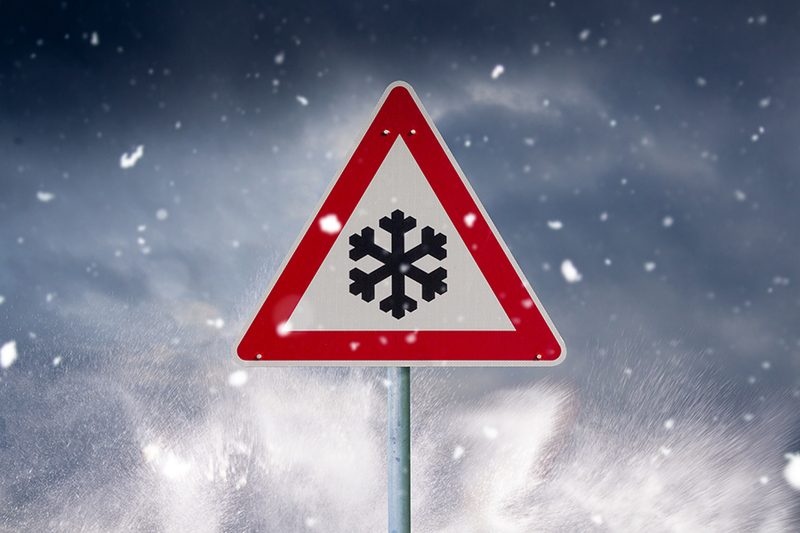 Winter weather can have a severe impact on the overall safety of your job site. But there are ways to reduce the effect the weather has on your team. Here are just a couple of ways you can reduce the risk of injury during the fall/winter months. When dealing with weather, often the small things are overlooked. Things like keeping a parking lot and walkway clear of water and ice can drastically reduce risk of injury. Make sure that snow is removed from a vehicle before operating and surfaces are free from water / ice. Also, remember to work methodically. It can be tempting to work fast in less than desirable weather to get back inside as quickly as possible, but it’s best to work at a slower pace and move with thought and intent. Outside workers should always dress in layers during the fall/winter months. Keeping in mind the temperature, their activity for the day and the wind. Workers should also wear gloves and footwear that fit snug and provide sufficient traction for walking and grabbing on the job site. Because the weather will be a factor during the later months, it’s a good idea to keep an eye on daily weather reports, maybe even having a radio or phone tuned to the weather at all times. Provide a daily update to your team at the beginning of the day to be sure everyone knows the possibility of bad weather when it is forecasted. Think about your site and how the weather could affect it. Dug out areas can have loose dirt during heavy rain, while cold, rain and wind makes equipment difficult to operate (especially those with a high profile). Since job sites can vary greatly, look at your current site and try to be proactive about safety. Keep all safety goggles clear, wear bright reflective outerwear and make sure all workers can be seen at a given time. Fog is something that often goes overlooked from a safety perspective, but it’s important to keep it in mind when scheduling a job. If possible, try to schedule later in the day when visibility on the jobsite is at its peak. These are just some of the ways to protect your team from the risk of adverse weather in the fall and winter. To have a thorough and completely free consultation of your risk factors and how it can affect your bottom line, contact EHS today. Workplace Safety: Where is your Focus? For questions, or to request your free consultation, please fill out the form below. This field should be ignored. The real email field is next. Due to the nature of our work, we are often on the job site. Please be patient with us! We aim to return all messages within 48 hours. Copyright © 2019. All Rights Reserved by EHS Management. EHS Management, LLC, and all of its programs, complies with any and all National and Wisconsin State regulations pertinent to the Environmental Health and Safety field. Any and all private and/or confidential information discovered by or shared with EHS Management during the course of our services will remain private and confidential. EHS Management, LLC will never share your information to anyone that does not have a business need to know it. EHS Management, LLC will never sell your information. EHS Management, LLC reserves the right to report any illegalities discovered during the course of Administering our programs and/or services.